Let's take a moment to look back 80 years to see how a 23-year-old Orson Welles awoke to find himself the most talked about man in America as his face and name appeared on newspapers from coast to coast. 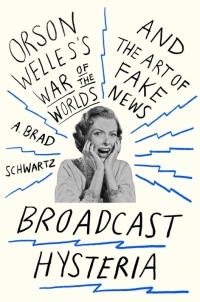 The book, "Broadcast Hysteria: Orson Welles’s War of the Worlds and the Art of Fake News" by A. Brad Schwartz, describes the scenario that caused some listeners to mistake the Mercury Theatre on the Air performance as a real alien invasion. In the aftermath of the broadcast, Welles went before dozens of reporters to answer a question that followed him for the rest of his life. Did he intend or anticipate, that "War of the Worlds" would throw its audience into panic? Apparently no one involved with "War of the Worlds" expected to deceive any listeners, because they all found the story too silly and improbable to ever be taken seriously. Mercury’s desperate attempts to make the show seem halfway believable succeeded, almost by accident, far beyond even their wildest expectations. Writer Howard Koch was hired to adapt the H.G. Wells story for the Mercury Theatre in less than a week. After three days, he called the producer John Houseman and begged to give him another story because "War of the Worlds" was not working. Houseman was unable to reach his partner so he lied and said that Welles was determined to do the H.G Wells story. Koch worked through the night and recorded a version to be played for Welles when he returned from rehearsing another play. Everyone that heard it agreed it was a disaster. Welles believed that the only way to save their show was to focus on enhancing the fake news bulletins in its first act. During the frantic rewrites, the first act grew longer and the second act got shorter, leaving the script somewhat lopsided. Unlike in most radio dramas, the station break in "War of the Worlds" would come about two-thirds of the way through, and not at the halfway mark. Radio audiences had come to expect that fictional programs would be interrupted on the half-hour for station identification. Breaking news, on the other hand, failed to follow those rules. People who believed the broadcast to be real would be even more convinced when the station break failed to come at 8:30 p.m.
Other important changes came from the cast and crew. Actors suggested ways of reworking the dialogue to make it more naturalistic or convincing. Frank Readick, the actor cast as the reporter who witnesses the Martians’ arrival, scrounged up a recording of the Hindenburg disaster broadcast and listened to it over and over, studying the alarm and abject horror in the announcer's voice, then replicated those emotions during the show with remarkable accuracy. Experience this piece of history yourself. The Bay Village Community Theater presents "War of the Worlds: The Panic Broadcast" by Joe Landry for five performances Oct. 19-28. For information on tickets, visit baytheater.org or call the box office at 440-847-8494. Patrick is Vice President of Education for the Citizens for Bay Village Community Theater. An organization whose goal is to continue to provide quality Community Theater and Theater Education. We are establishing working relationships with civic groups, non-profit organizations, government, and businesses to keep community theater an active and vital part of our city. Visit Citizens For Bay Village Community Theater on Facebook or contact us at bay.village.community.theater@gmail.com for updates and our meeting schedule.